A 3 phase SCR controlled rectifier allows us to convert a 3 phase 120 degree phase shifted waveform set to a constant DC voltage. Due to its high rating, SCR full wave rectifier is extensively used in industrial applications where it can feed load up to 120kW. SCR is a switch which behaves in the same way as a PN diode except that it is a semi controlled switch instead of uncontrolled switch. It blocks the voltage applied to its anode with respect to cathode till a small current pulse at its gate terminal is applied. The instant gate pulse is applied to the gate terminal, our switch SCR starts conducting and behaves like a normal PN diode in forward biased mode. 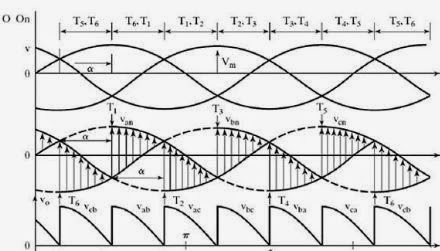 A separate Pulse Generation circuitry is used and its triggering instants thoroughly adjusted which are used to trigger gate terminals of the SCRs connected in the 3 phase full wave SCR controlled rectifier. SCRs are triggered at a delay of π/3 radians for every cycle of input. The output of rippling DC is 6 times of the input waves so no quite much filtration is required. A circuit consisting of three single phase AC voltage sources having 30V peak amplitude with a phase displacement of 120 degrees has been generated. Its output is first checked to ensure it is working in a normal fashion. The output of these sources comes in the form which is shown in the figure. Since a voltage of 220V RMS does not appear quite frequently as output of the generator in case of a wind turbine, we reduce it to a practical case such that the output of the controlled rectifier would be 48V DC. This output ensures the proper charging voltage for battery bank which is present on wind turbine site and can be used effectively as an input to the inverter which will convert it to AC and then step up its value to 220V RMS valued AC voltage which will be used to run domestic appliances. Here a problem occurs; the output of the wind generator is random. Because of this random generation, we cannot always be sure the output of the rectifier will be 48V DC. 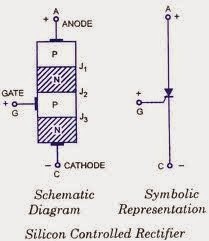 The practical case values of rectifier are variable. To overcome this problem, a Boost Converter is a remedy. It converts lower value DC to a fixed value DC. The working of the Boost Regulator is discussed in later sections of this report. In any power controller application, we are required to build a separate triggering circuitry which controls the turning on and off of the switches. These techniques had been both analogue and digital. Analogue triggering methods were used in early days of solid state controlling. It employed usually a device which had a discrete conducting and non-conducting region. The rapid transitions between these two modes allowed us to control gate triggering pulses in early power controllers. These circuits were addressed as relaxation oscillators in Electrical Engineering literature. Modern triggering circuits employ digital techniques. They have a microprocessor incorporated in the system. A program is burned into its ROM. It is interfaced with different sensors of the systems and therefore can decide the firing of the gates in an intelligent way by acquiring different physical parameters (Load Demand, RPM, and Acceleration) of the system in real time and thus adjust its firing sequence and rate. The technique we are using in our project is PWM triggering. This is discussed in next parts. Pulse width modulation is a technique in which the width of pulses, which are present in a pulse train, is varied in relation to a control parameter. By varying the pulse width, we change the duty cycle of the pulses and then use these varied pulses in our circuits. PWM also finds its application in communication systems where it is used to encode digital data streams. The main advantage of using PWM is that the power losses are low because when the switch is turned off, current stops flowing through the load circuit. PWM generator circuit is used in triggering SCRs in our project. It has no unit because it is a ratio between two similar quantities and its value ranges from ‘0’ to ‘1’. A Boost Regulator works in two modes. One mode is called ‘On’ Mode and second mode is called ‘Off’ mode. During ‘On’ mode, the electronic switch is turned on for a brief instant of time and the inductor is directly connected to the low voltage DC source. The current follows the path I specified in the figure. Current is limited from exceeding a safe value by the inductor which stores it in itself in the form of an electromagnetic field. During ‘Off’ mode, the electronic switch is turned off thus rendering path I as open circuit. The energy stored in the inductor is discharged across diode and capacitor and makes a high voltage appear across the capacitor. 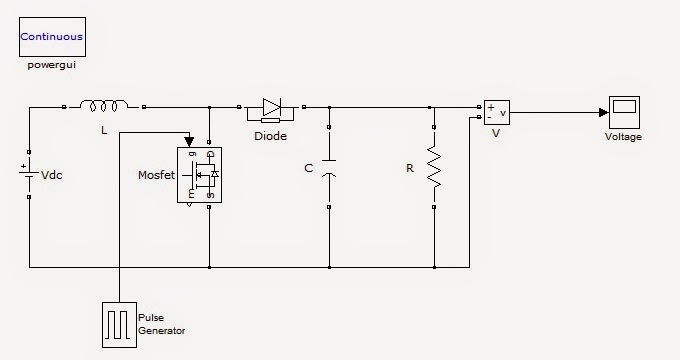 Capacitor gets charged to this high value DC voltage and load, which is desired to be operated on high voltage DC, can be connected in parallel across this capacitor. Three phase inverters find their application in areas of variable frequency operations and HVDC power transmissions. A three phase inverter is actually a set of three single phase inverters connected together and operating in a parallel configuration. Each inverter switch is connected to one of the three terminals of the load. Load is usually 3 phases Y connected balanced one. Switches are electronic which are controlled by triggering circuitries. 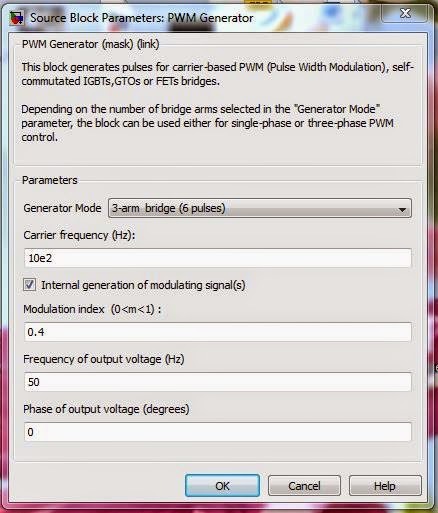 Pulse generators are used in our simulation for the control of switches. We are using 180 degrees conduction mode inverter here. Three switches are triggered in such a way that no two switches in a same leg are turned on simultaneously. Switch combination is selected such a way that at any instant, three switches are conducting. After 60 degrees, another set of switches would be conducting but overall, a switch has conduction period for 180 degrees. Harmonic content is present in the output. Pure sin wave can be obtained after filtration.